NSE Nifty continued to rule above the 10,550 points at 10,553.45 points, with a hefty rise of 173 points or 1.67 per cent. All the sectoral indices led by auto, metal and oil and gas were trading in the positive terrain with gains up to 3.67 per cent. Mumbai: Continuing its rally, the BSE benchmark Sensex reclaimed the key 35,000-mark after nearly one month by surging over 570 points in late morning trade on Friday as buying pace gathered momentum, triggered by fall in global crude prices and encouraging corporate earnings. Moreover, positive leads from other Asian markets also fuelled the uptrend. 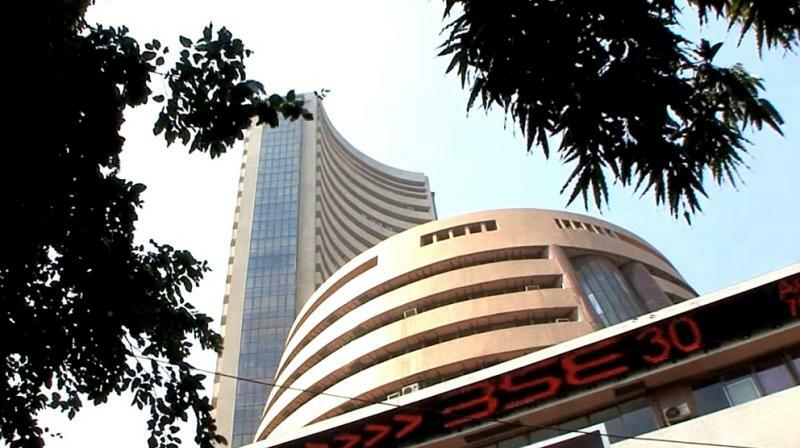 The 30-share Sensex after opening on a strong footing continued its upward march and regained the 35,000-mark to quote 569.96 points, or 1.66 per cent, higher at 35,001.93 points at 1130 hours. It touched a high of 35,029.28. The NSE Nifty continued to rule above the 10,550 points at 10,553.45 points, with a hefty rise of 173 points or 1.67 per cent. Investor sentiment got a big push after Brent crude, the international benchmark, dropped below the USD 73-mark to quote at a seven-month low of USD 72.65 by falling 3.48 per cent, traders said. Adding to the upbeat mood, strengthening rupee against the dollar and a firm trend at other Asian markets, tracking overnight gains at the Wall Street after US President Donald Trump said trade talks with China were "moving along nicely". Foreign institutional investors (FIIs), which had been selling on the Indian bourses, made fresh purchases worth Rs 348.75 crore Thursday, while DIIs sold shares to the tune of Rs 509.17 crore, provisional data showed. Major gainers were Vedanta, Hero MotoCorp, M&M, Adani Ports, Yes Bank, Bharti, Airtel, Maruti Suzuki, IndusInd Bank, Tata Steel, Bajaj Auto, Asian Paint, L&T, RIL, Axis Bank and HDFC Bank, rising up to 6.13 per cent. Shares of state-run oil market companies such as HPCL, BPCL and IOC rose up to 7.52 per cent, largely supported by fall in crude prices in the global market.